Presently, the ‘Canadian Whisky Painters’ is a small group of painters who all come from different creative backgrounds. Whether a ‘Canadian Plein Air Painter’ and/or ‘Urban Sketcher’, we all share the love of painting and the friendships that go along with it. We’re just starting out and we look forward to some good sketching sessions and events. I am foremost a watercolour painter, and for the last twenty years I have painted out doors… of course, weather permitting. I live on the west coast of BC where rain and mists are very interesting to me. The wild seas and giant rain forests are what I paint. I have shown and sold my work since the fifties… what you might call my life work, my life journey. I’m a Canadian Plein Air Painter and a Canadian Whisky drinker. I love both. I consider myself a perpetual student, continually learning the art and craft of painting from the landscape around me and from interaction with my fellow painters. My intent and style is to abstract and simplify while trying to impart the emotion, or warmth, or mystery of a scene. 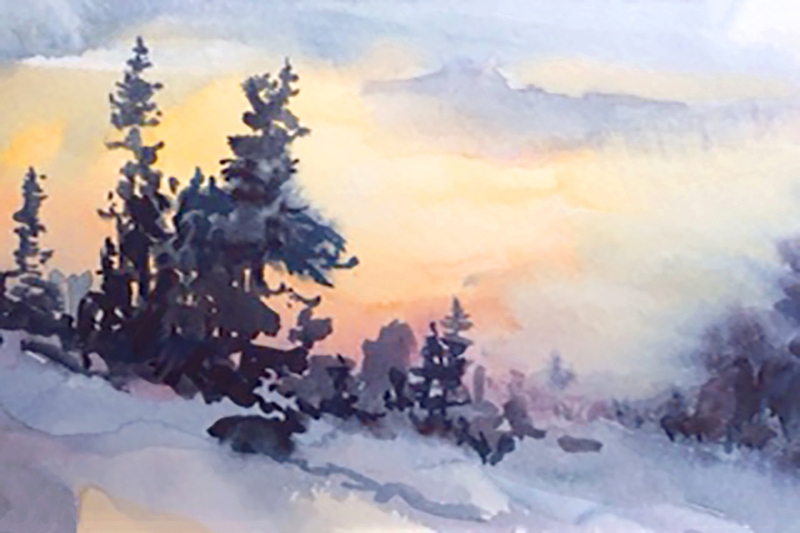 My preferred medium is oil paint and so I am learning to appreciate the versatility and beauty of watercolour – a task made much easier when using whisky as a medium and a source of inspiration. As a painter, I’ve enjoyed experimenting with different mediums, subject matter and points of view. I try to achieve a fresh and effortless feel in my work. 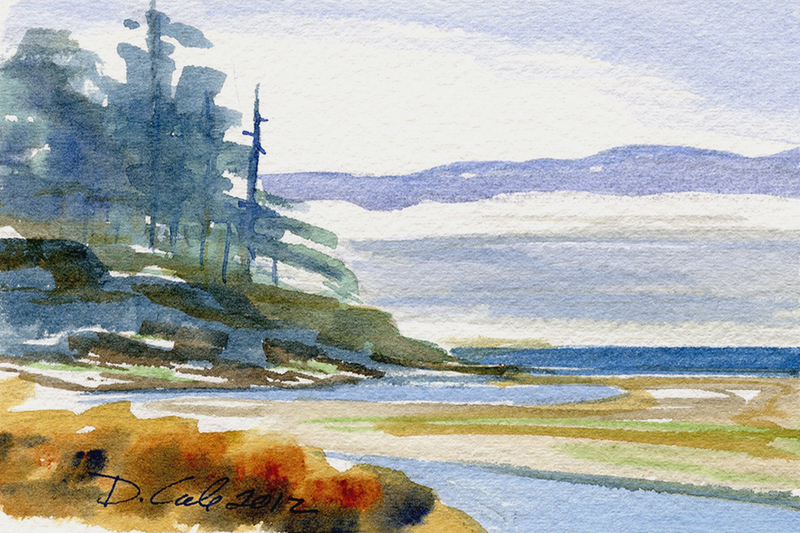 In the last few years I’ve painted out doors where the west coast of Vancouver Island provides endless inspiration. I am a mixed media artist and work mainly with acrylics. I often use vintage papers and ephemera to create interesting backgrounds for my paintings. I spent much of my childhood camping and exploring the abundant marshes, forests and lakes with my family near Prince George and the interior. Some of my fondest memories were the times spent with my naturalist father at the “slough”, armed with binoculars, camera and a rubber dingy. My artwork reveals my passion for anything vintage and seeing beauty in “old” as well as delighting in the fine detail and artistry in nature. I enjoy painting outside anywhere in the world and in the studio. My work reflects my love for my country, which I nicknamed “my big backyard.” I am inspired by the diverse scenery that I encounter in different locations across Canada and the world. The land is in constant flux due to changing light. I hope my work portrays the emotional impact of the scene at that particular point in time. I have been drawing and painting all my life. I have been a gallery owner as well as an illustrator. Presently I work as a jeweler creating pieces that are inspired by nature. There is nothing I enjoy more than spending a day painting. 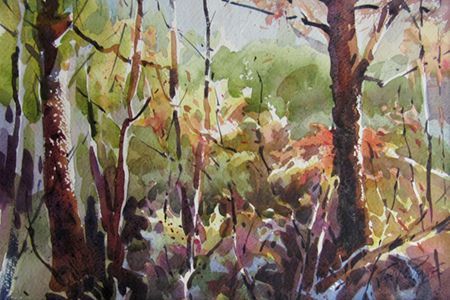 I paint landscapes and figures in watercolour and oil. I’m a Visual Artist, Canadian Plein Air Painter & Canadian Whisky Painter. Prior to the fine art career, I was a freelance illustrator, which included graphic design and painting murals. Over the years, I’ve pursued several subjects, including the figure, portraiture, landscape and non-representational work. I’ve also enjoyed working in several mediums, including oil, acrylic (both brush & airbrush), gouache, graphite, felt marker, and digital. I love doing what I do! I took a workshop a couple years ago on pen and wash. Being a still life oil painter, this workshop was on the outer limits of my artistic interests. But hey, it was something different and looked like fun. I loved it; a combination of wonderful sketchy freedom with the playfulness of watercolour washes. How terrific! 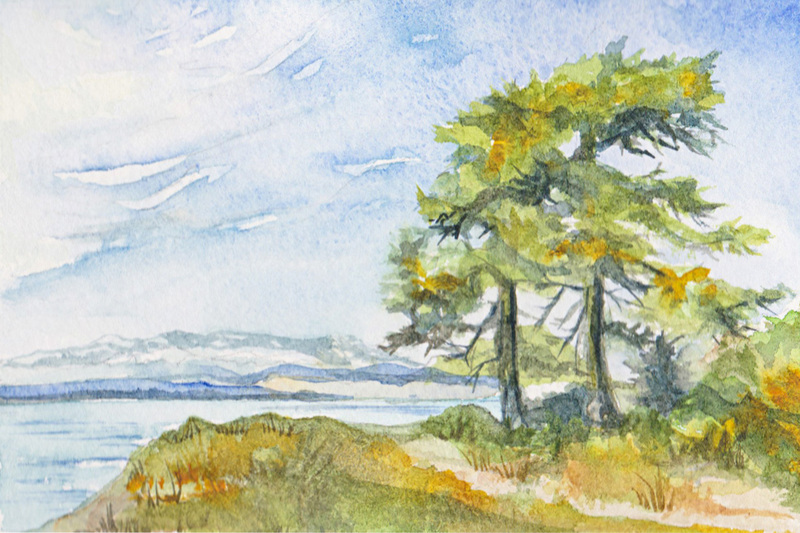 Hiking with your watercolour kit on Vancouver Island. does it get any better. 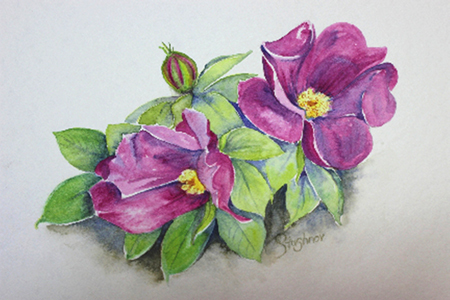 In the 20+ years since my career as an Environmental Biologist, I’ve been enjoying my time painting and drawing. Works vary from smaller plein air paintings to large studio abstracts. 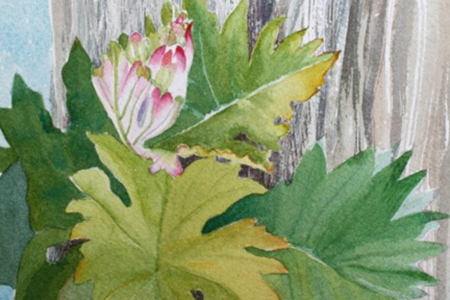 I am fascinated with colour compositions and textural works depicting nature. 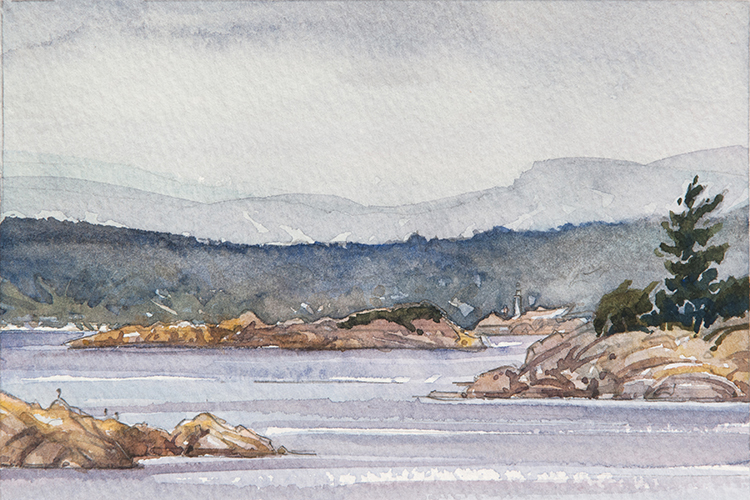 Current works are mostly plein air, carried out around Victoria and Vancouver Island. My Flickr site shows the progression of my interests over many years. I am a dancer, writer, painter, gardener, costumer, and baker. I am most happy when creating something, choreographing a dance, a poem, a painting or a muffin. 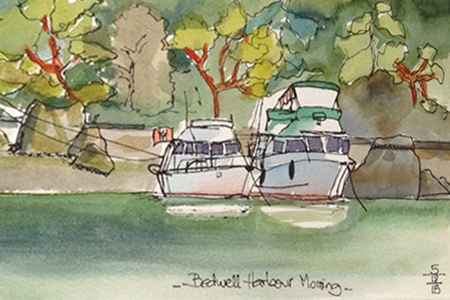 Since moving to Victoria in 2007, I have been painting en plein air. Painting outdoors creates an opportunity to engage with both the environment and one’s immediate response while trusting one’s skills. 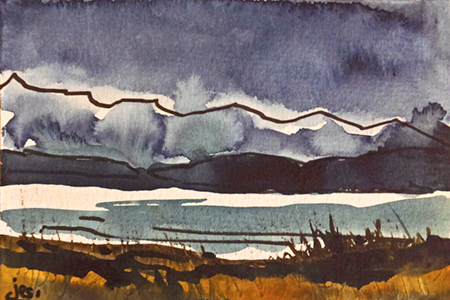 Armed with a small sketchbook, watercolours, pen and brush, I head out to interpret the world around me. 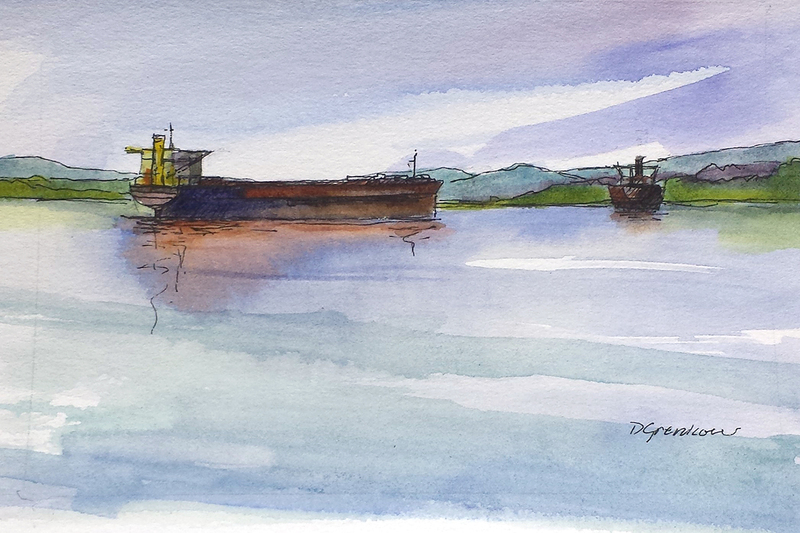 Finding watercolour painting in 2003 has been an amazing and life altering experience for me. My life has included many forms of creative pursuits and I am so happy that painting and teaching have enriched my development. Art is a wonderful balance to all the more prescribed places where we find ourselves immersed. I have enjoyed the guidance of excellent teachers and patient mentors in developing my representative style of painting.. The interplay between lights and shadow is a constant inspiration, and to mentally plan how to recreate such moments on paper is an ongoing joy as well as a journey in my painting experience. To be able to formally include wine or whiskey into this creative process can only make the journey more fun! I’ve loved painting with watercolour since I was a little girl. Mostly I paint large, but I often make small sketches as ideas for larger paintings. Our farm and vineyard on the beautiful Saanich Peninsula is the source of many of these images. 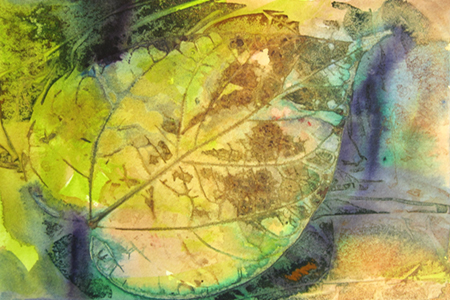 I use a variety of mediums, including watercolour, oil, acrylic and computer graphics. 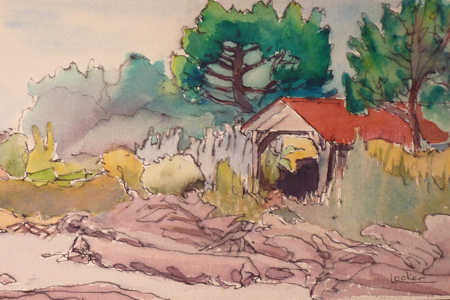 Plein Air painting is relatively new to me and I’m finding that it’s adding another dimension to my imagery. There is not a day when I don’t think about “mark making”- be it a burnt stick or a pot of paint. For a number if years, I lived in the Thompson River dry belt where the view is either dramatic – or subtle and muted – very different from the blues and greens of the coast where I was born, and have now moved back to. 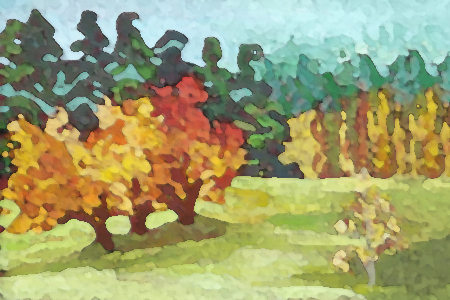 All my art is now landscape based – whether abstract or representational. 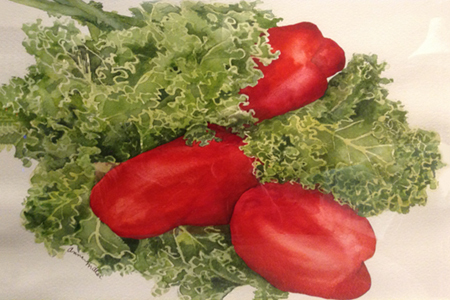 In the past I have enjoyed pastel, watercolor, oil, and acrylic mediums – today the subject “tells me “what medium to use. What fortunate people we are – to work at something we love. Donna graduated from the Ontario College of Art and Design and enjoyed a successful career as an art director and graphic designer in Canada, England and the USA. 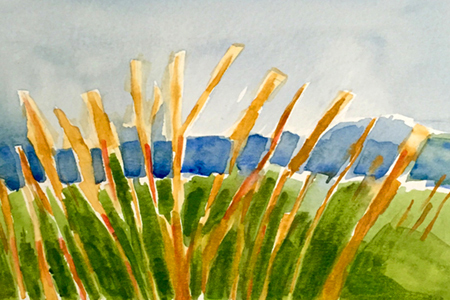 She now focuses her creative energy on watercolours, painting weekly with the Al Frescoes in Victoria and teaching drawing. Jan Poynter is a professional artist, illustrator and instructor from the Sunshine Coast in British Columbia, Canada. 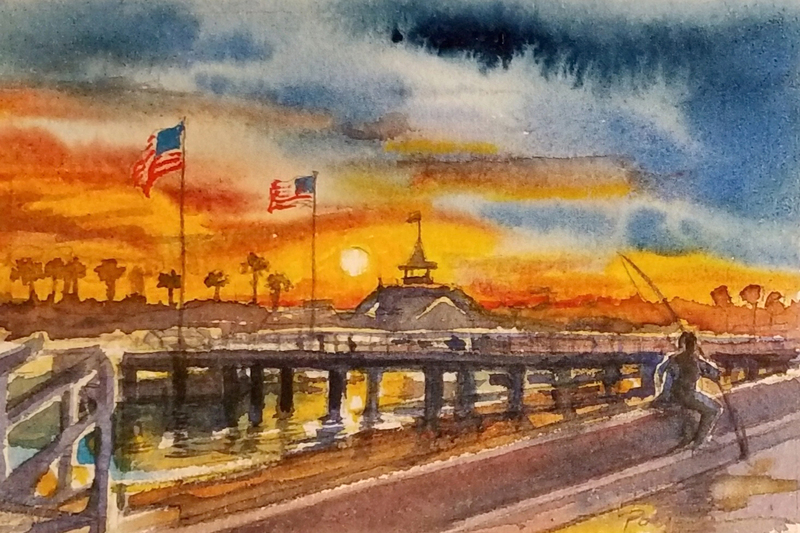 Her conceptual rendering abilities have contributed to her fine art and commercial career with expertise in watercolor and acrylic painting, pastel, and traditional scratchboard. With over 30 years teaching experience Jan shares with her students all her knowledge and energetic joy in creative expression. Art had always been part of my life and even though I spent most of my life as an Architectural Illustrator my real passion was to capture the Canadian landscape as a Plein-Air painter. I feel fortunate to have the ability to share what I feel through my art and at the same time to call many wonderful and talented artist my friends. 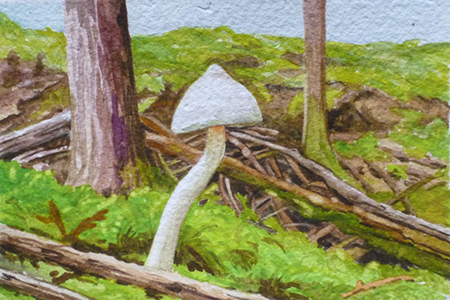 I am a Vancouver Island artist, I paint mainly in oils and acrylics but watercolours was what I started with more than 15 years ago. 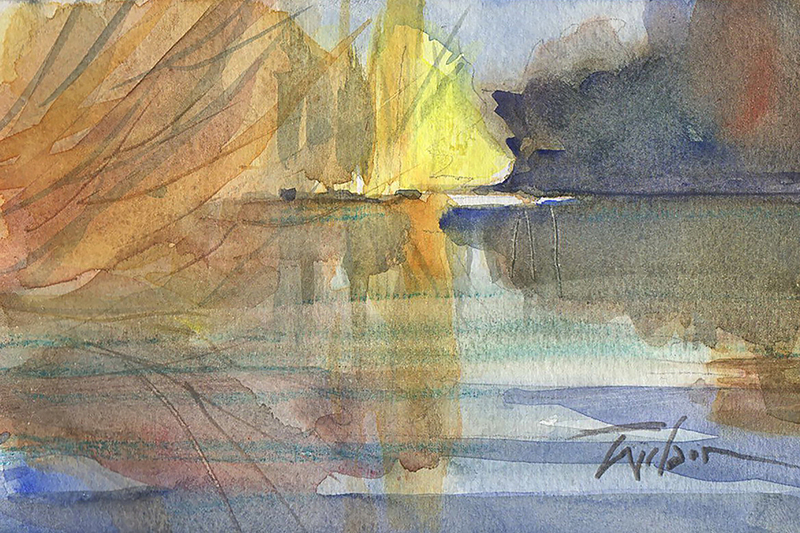 Gardens, traveling, nature, landscapes, seascapes, reflections, boats and marinas found around British Columbia’s Gulf Islands are never ending sources of inspiration for me. I strongly believe there is no end to learning and growing as an artist, and for that I paint in the studio or en plein air as much as I can! 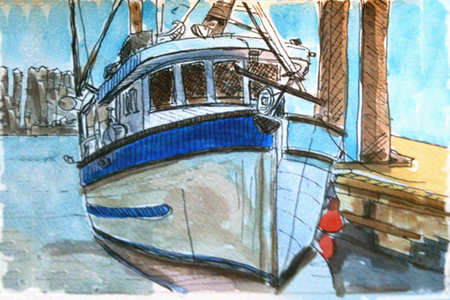 I am a Vancouver Island artist and my work is mostly representational. I started out as a watercolour painter and along the way have included oils and acrylics in my repertoire. Whether painting en plein air or in the studio, I endeavour to capture the light and the feel of my subject. I am a representational painter who works both in the studio and in the field. 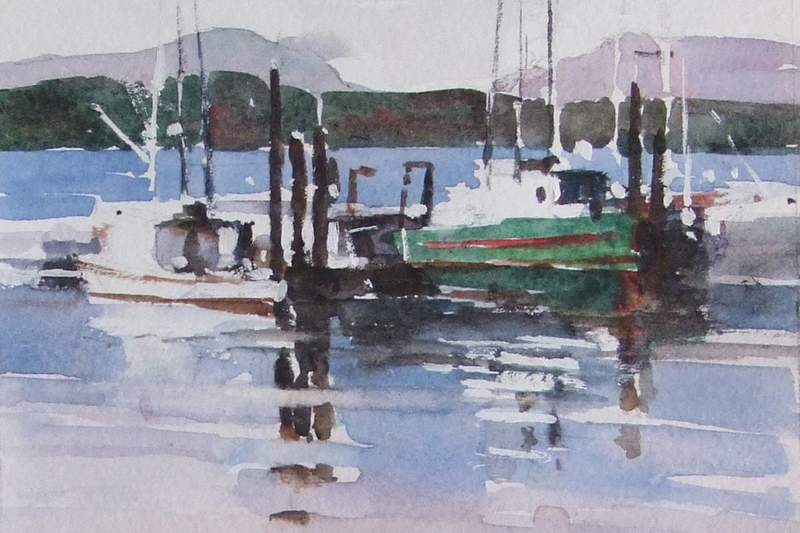 I live on the west coast of British Columbia and have been working in oil and watercolour for many years finding inspiration in the local landscape, boats, marinas and the sea. I am passionate about my work; I truly love it and paint every day. Painting is a challenge, but always fascinating and deeply fulfilling. During my first life in South Africa I painted in oils, then I was told by a top artist that I should switch to watercolour! Say what…? It’s like telling a rugby player that he should rather be playing SOCCER. Or Ice hockey to field hockey….. Now in my second life in Canada I’ll admit that I’ve always regarded w/c as my private/personal medium. Oil versus watercolour. May the best medium win.